Nalboor Tiles Marble The Complete Marble Flooring Buying Guide: Choose The Right Floor Every Time! The Complete Marble Flooring Buying Guide: Choose The Right Floor Every Time! It’s easy to feel overwhelmed by all the flooring options that are available. If you’ve ever shopped for marble, then you know that it comes in multiple colors. You can get shades of white, brown, beige, red, brown, and even green. You also have several different options to consider when it comes to size and finish. Some are polished and honed for an excellent shine, and others are tumbled to reveal more texture. When it comes to your project, it’s largely a matter of personal choice. However, there are some guidelines you can follow to make the right decision. You may love the rich look of Calacatta Gold, but your budget may limit you to Vanilla Oro. Before you start shopping for tiles, take a moment to consider your budget. Remember that there are ways to stretch your renovation dollars. Rather than waiting for a sale and hoping that the store has what you want in stock, start by reaching out to a wholesaler. Here at Nalboor Tiles, we offer everyday low prices that are very attractive to homeowners and contractors alike. We also have special bulk pricing rates. If you’re doing a large area in one style of tile, then you may be able to bring the price down so that you can afford a more luxurious style. Before you decide that the marble you love it out of reach, see what kind of pricing we can provide you with. Marble is known for having movement across the stone. While some tiles are more subdued with minimal graining, others have noticeable patterns that really stand out. Calacatta Gold marble, for example, features a white background highlight with gold, blue, and yellow veining that travels across the stone in a bold splash. It has an artistic look in and of itself, and you’ll love how attractive it is. However, the Calacatta Gold won’t work with all projects. If you’re already going with heavily detailed cabinets in your kitchen, then you may want something more subtle to balance it all out. This is where you may prefer to invest in White Wood Gray marble tile. It still has movement with its wood-like grain, but it’s a far more subtle finish that won’t take any attention away from your cabinets. If you want a plain finish that still shines and looks amazing, then Vanilla Oro may be the right choice for you. Choosing colors can be challenging. You have to decide if you want the shades to contrast sharply or blend together seamlessly. This simple question can provide you with a little more direction when it comes to the design. Remember a general rule of thumb is that dark colors make your space feel more intimate while light colors visually enlarge the same area. Monochromatic designs are very elegant, but you may prefer the bold finish that comes with contrasting shades. You can match almost any color walls, furniture, and cabinetry to a light colored floor. However, if you’ve fallen in love with dark flooring, then you’ll want to balance it out with some lighter shades on the elevated areas. Emperador Brown dark marble may overwhelm a space if you have mocha cabinets, but you can balance it out with lighter shades in the woodwork for a stunning finish. Marble is a highly durable stone that can easily be used for interior or exterior applications. It looks amazing and the color will last forever. However, it can be slick if you use a highly polished tile in an area that tends to be damp. This is why businesses with marble foyers will usually have large mats on them to dry shoes. There are a few ways you can address any concerns over traction. The first is to go with smaller tiles. The grout lines between marble tiles naturally create additional traction, so stick with 12-inch squares that will help you hold your footing. The second option is to choose a different finish on the surface. Rojo Alicante tumbled tiles feature a slightly textured surface that will help you keep your footing, but the beautiful marble patterns still show through. This makes tumbled tiles an amazing choice for patios, porches, and other outdoor areas. In the bathroom and kitchen, go with a tile that has a low-gloss finish. The marble will still be honed and sealed to keep water out, but you won’t have to worry about sliding across the floor when it’s wet. 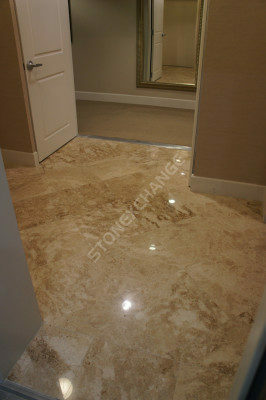 Save the highly polished marble for living rooms and bedrooms that won’t see much water. It may take you a while to choose the perfect marble for your project, and that’s perfectly acceptable. Unlike carpeting that will need to be replaced in 7 to 10 years, you can expect your marble floors to last as long as the structure. You’ll never have to replace it again, so you want to be sure that you love it. When you’re ready to place the order, choose a company that will provide you with great customer service, excellent rates, and fast delivery. Nalboor Tiles, we do our own mining and manufacturing. We’re very selective about the pieces that make it from the ground into your home, so you can trust our team for quality pieces. We have excellent rates because we’re able to keep costs down through every step of the process. When you place an order, we can have everything shipped directly to your home for your convenience. You can count on our representative to answer any questions you have, help you choose the right marble for your project, and step you through the ordering process. Give Nalboor Tiles a call today at 305-501-4548 to review our available stock and place your order.